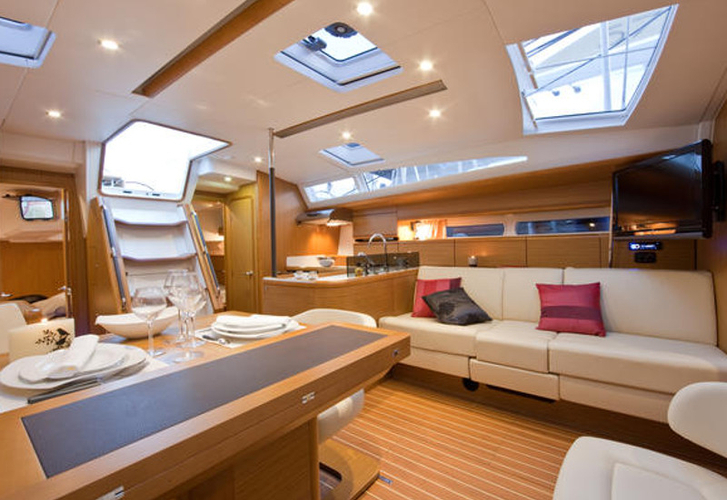 Sailboat Jeanneau 53 named J 53 14 MAL has been manufactured in 2014. J 53 14 MAL is registered for 12 passengers. Layout of the boat is 12 (10+2). 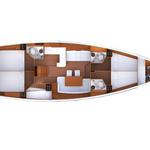 Jeanneau 53 J 53 14 MAL is equipped with 6 cabins. For comfort of passengers there are 4 bathrooms. You can fill the diesel tank with 240.00 l liters and in water container it goes even 950.00 l l. With engine Yanmar 110 hp J 53 14 MAL can move really fast. J 53 14 MAL is 16.15 m long and 4.77 meters wide. Depth is 2.28 meters. Vessel's equipment involves : Autopilot, Gps plotter, Gps, Bimini top, Anchor electric windlass, Radio / cd player, Furling mainsail, Bow thruster. . Nonrefundable deposit accounts for 3000.00 EUR. 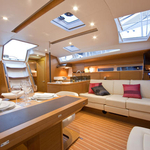 Choose our offer and have good time on the deck of J 53 14 MAL.